If your baby is born in a hospital, testing will more than likely start right after birth. Depending on where you live, your newborn may be tested for a variety of disorders. It is good to become familiar with these tests and procedures so you can make decisions and include these in your birth plan. If your baby is born in a hospital, testing will begin immediately after the birth. Depending on where you live, your baby may be tested for a variety of disorders. In addition to testing, there are several procedures that are common after the birth of a baby. Become familiar with these procedures so you can make decisions and include these in your birth plan. The baby’s first test is the APGAR. This is done at one and five minutes after the birth to evaluate the baby’s condition. The test was developed by Dr. Virginia Apgar to assess newborns. 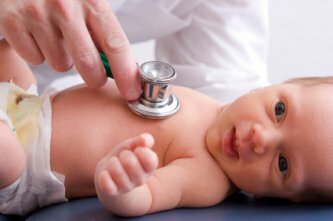 The test assess five areas to determine baby’s condition at birth. These are Activity, Pulse, Grimace, Appearance and Respiration. Each area is given a score from 0 to 2. The total possible score is 10. Don’t panic if your baby doesn’t have a perfect score; most babies don’t. The PKU test is done in the hospital to check for a genetic disorder known as phenylketonuria. This is often done twice, once in the hospital and once in the doctor’s office after the [tag-cat]baby[/tag-cat] is discharged. There is some controversy about this test being done in the hospital, especially for breastfed babies. The initial test may not be valid and will need to be repeated in the doctor’s office later. Eye drops are given to newborns to protect their eyesight against potential infection from STDs that can affect their eyesight or cause blindness. The drops are given to all babies and may be mandated by the state. Newer drops contain antibiotics, rather than silver nitrate. These drops don’t burn as much, but blur the baby’s vision, preventing her from seeing you clearly. A Vitamin K shot is given to help in blood clotting. This became popular with the use of forceps. Some parents question the need for the shot since humans have lived without it for nearly all of our history. This is another procedure you may be able to postpone until after the initial bonding and breastfeeding. Depending on where you live, your baby may be given a hearing test. Some states require this early screening in an attempt to identify children at risk for hearing difficulties while they are still very young. If a child has a hearing issue, the sooner it is known the better for the child. This test is painless and can sometimes be done in your room, if you are rooming in with your baby. Some parents are concerned about the testing and procedures done to their newborns so soon after birth. These parents want time to bond and give breastfeeding a try before the baby is submitted for testing, eye drops, vitamin K shots and other medical procedures. If you want to delay any of these procedures, speak to your doctor while you are still pregnant. Other testing may be done as needed, depending on your situation. For example, if you are diabetic or suffered from Gestational Diabetes, your baby’s blood sugar may be tested. Babies born to mothers with gestational diabetes sometimes experience low blood sugar at birth. If this happens, the baby may be given some sugar water. Will You Find Out Your Babyâ€™s Gender?